I’ve recently returned from two weeks in America, and spent some of that time at places like the Arts Institute in Chicago and the Piermont Morgan Library and Museum in New York. I’ve seen lots of very, very beautiful things. One of the effects of all of this has been to prod my thinking about the arts, and their relationship to research. I keep seeing things that move the viewer or listener, and I keep thinking about the limited readership and impact of the world of academic writing. It’s not true for the established academics, of course – the Britzmans, Shulmans, Darling-Hammonds – but for people like me, it can be a bit of a game, where you get published to rack up the points but it doesn’t have much impact on anything real. Dickens created characters of greater intensity than human beings, characters who belong to poetry like figures of Dante or Shakespeare. As I read these words, shivers started to run along my spine. I had to sit down for while, before going through the door. Why such a strong reaction, I wondered? What was it about those specific words? I think I located at least one part of the explanation. 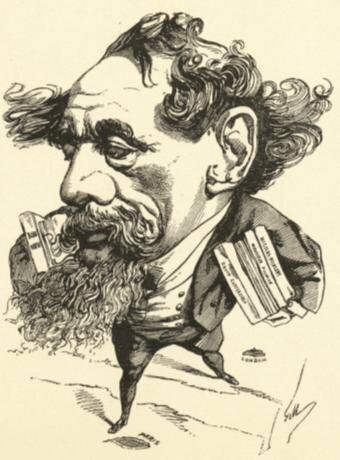 Dickens created characters ‘of greater intensity than human beings’. He exaggerated virtues and foibles, traits and mannerisms, in order to explore and expose tensions and issues that were not seen clearly by Victorian England. He created vivid, complex worlds. His readers were moved. His novels had an immediate and powerful effect. The contrast with the much of the academic writing that researchers publish in journals is stark. Is there, I’ve been wondering, any chance of a researcher writing a piece of fiction – a short story or even a novel, or some poetry, or a film, or a photo story – which is footnoted and has an extensive annotated bibliography? A kind of Bleak House with footnotes? Is this kind of thing being done anywhere within academic circles? I think this is where this American experience has been leading me, to thinking about the possibilities of an academic fiction, different from New Journalism (in that it requires a kind of explicit academic rigour not expected of a Truman Capote or Norman Mailer) but also different from more traditional narrative inquiry (because it’s wanting to go beyond using narrative techniques in reporting real events; it’s wanting to write fiction with composite characters and invented dialogues and scenes). This entry was posted in Mythopoetics and tagged Dickens, fiction, mythopoetics, narrative inquiry, research by steveshann. Bookmark the permalink. Would the work of Julian Barnes and Georges Perec qualify as this kind of academic fiction with footnotes? In film what about Alain Resnais ? I am thinking of his film Mon Oncle d’Amerique (My American Uncle). Thanks Clare. I’ll follow these up.